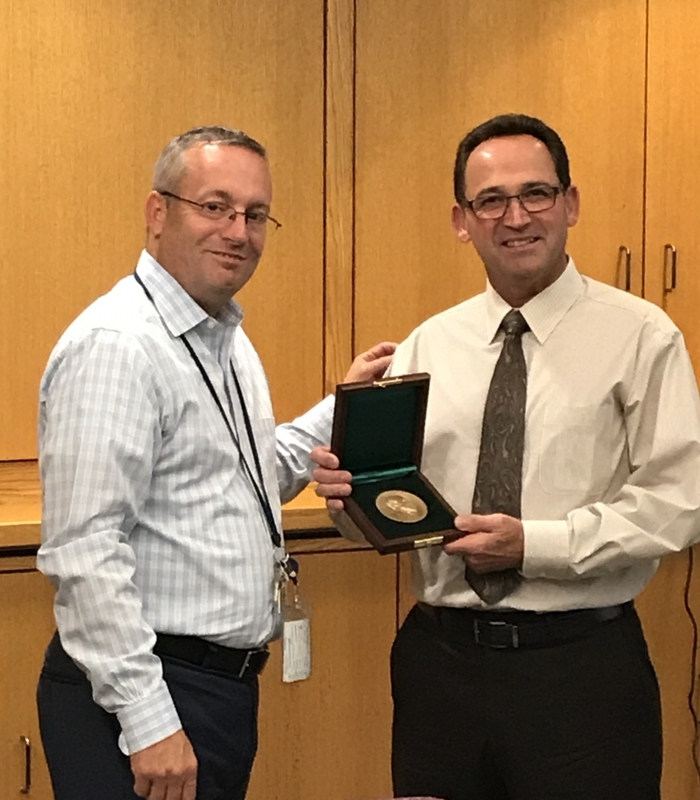 Airport Director Craig A. Williams, left, presents the Carnegie Medal to Carnegie Hero Richard R. Krul at the Bishop International Airport’s authority board meeting Sept. 25 held at the airport in Flint, Mich. In June, 2017, an on-duty airport police lieutenant, 55, was walking with Krul, 60, of Grand Blanc, Mich., when an assailant armed with a knife attacked the lieutenant from behind, stabbing him in the neck and shoulder. Seeing him about to stab the lieutenant again, Krul blocked the assailant’s motion. A struggle ensued, in which Krul took the assailant to the floor and others responded, helping to subdue and disarm the assailant.